Residents on Simbo Island reported feeling seven "earth tremors" on 21 September, and others in recent days. None of the events caused damage. The Solomon Islands Seismology Division does not have monitoring equipment on the island. The Global Volcanism Program has no Bulletin Reports available for Simbo. Simbo is a small island in the western Solomons with three truncated andesitic volcanic centers. The only Potassium-Argon date (2.3 +/- 1 million years ago from Mount Patukio) suggests a Pliocene-to-Pleistocene age for the island (Solomon Islands Geological Survey, 1982). The southern half of the island is thermally active. It contains fault-related fumarolic areas and hot springs near saltwater Lake Ove along the western coast and along the eastern coast near Mount Patukio, which has a steep-walled summit crater. Grover (1955) noted native accounts of the explosive enlargement of the Ngusunu explosion crater along the SW coast of the island one to two generations prior to 1955, probably after a visit by Guppy in 1882. Press reports mentioned an eruption in the early 1900s that forced the evacuation of villages beside Lake Ove, immediately adjacent to Ngusunu crater. Solomon Islands Geological Survey, 1982. Vella Lavella Island. New Georgia Geol Map, sheet no 1, 1:100,000. Taylor G R, 1976. Residual volcanic emanations from the British Solomon Islands. In: Johnson R W (ed) Volcanism in Australasia, Amsterdam: Elsevier, p 343-354. 1910 ± 10 years Unknown Confirmed Anthropology Ngusuna crater? There is no Deformation History data available for Simbo. There is no Emissions History data available for Simbo. The saltwater Lake Ove in the foreground is seen from the rim of Ngusuna crater with the western coast of Simbo Island in the background. 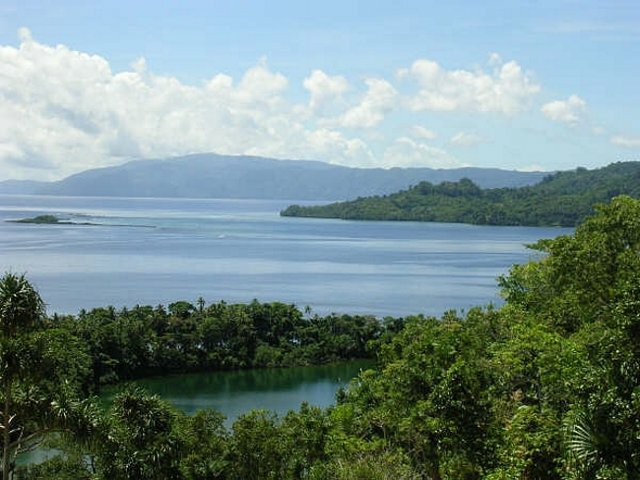 Simbo is a small island in the Western Solomons with three truncated andesitic volcanic centers. Native accounts told of the explosive enlargement of the Ngusunu explosion crater along the SW coast of the island one to two generations prior to 1955, probably after a visit by Guppy in 1882, and press reports mentioned an eruption at Simbo in the early 1900s. Photo by Chris Lyne, 2005. There are no samples for Simbo in the Smithsonian's NMNH Department of Mineral Sciences Rock and Ore collection. Large Eruptions of Simbo Information about large Quaternary eruptions (VEI >= 4) is cataloged in the Large Magnitude Explosive Volcanic Eruptions (LaMEVE) database of the Volcano Global Risk Identification and Analysis Project (VOGRIPA).